Use this vanity to bring more modern style into your bathroom. Its white artificial stone counter and black particle board base will look beautiful in your home. Put a nice touch on your bathroom's look with this vanity set from GLACIER BAY. 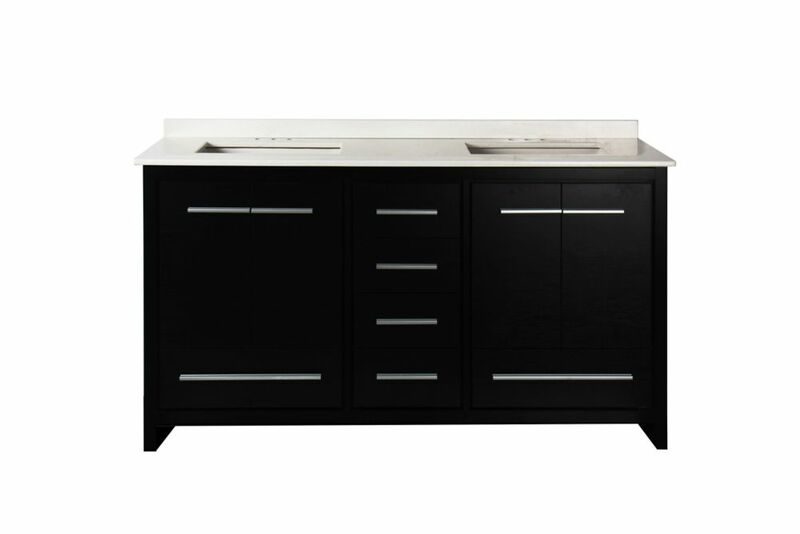 DECOLAV's Ambrosia Vanity includes a black granite top with single faucet hole drilling. The Satin Nickel hardware and built-in towel bars adds understated elegance. The single drawer with dovetail joints provide ample storage space. Romali 60-inch W 6-Drawer 4-Door Vanity in Black With Artificial Stone Top in White, Double Basins Use this vanity to bring more modern style into your bathroom. Its white artificial stone counter and black particle board base will look beautiful in your home. Put a nice touch on your bathroom's look with this vanity set from GLACIER BAY. Romali 60-inch W 6-Drawer 4-Door Vanity in Black With Artificial Stone Top in White, Double Basins is rated 4.0 out of 5 by 1. Does it come with sinks? Yes, the Romali 60 inch comes with 2 sinks(already installed on the vanity top). What is the spacing of the predrilled holes? It is predrilled with 3 holes for a 4inch widespread faucet. 2 sinks included, so you need to prepare 2 faucets with 3 holes for a 4inch centerset.